apio equino, apio macedónico, perejil macedónico, esmirnio, olosatro, OCast alixandria, Port and Gall salsa de cavalo, cegudes, apio dos cavalos, roses de pé de piolho, Cat api cavallar, abil de siquia, julivert de moro, cugul, aleixandri, Hisp Ar karats barri, Gr hipposelinon, L Smyrnium olusatrum, Eng alexanders, alisander, maceron. 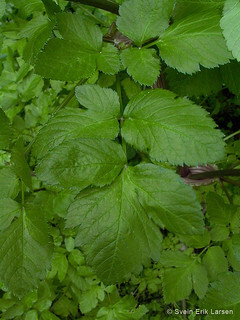 The Greek word means parsley or horse celery. The Hispano Arabic name was applied to differentiate it from other celeries in medieval Spain but the English ate it as celery. 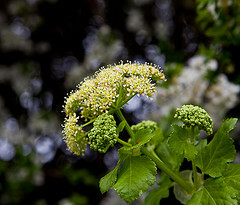 Alexanders are thought to be of Macedonian or oriental origin. Since the 4 C BC, they have been known as a medicinal plant. Dioscorides wrote that the seeds, with wine, were taken for the oil stimulated the flow of menstrual blood and that the leaves and roots could be eaten. Cuminal, an essential oil that is something like cumin, is contained in the fruit. Galen thought it not as active as celery. For dog bites and calculus, Pliny recommended a decoction containing the root and wine. Strip the leaves off the stalks and discard the stalks. Soak bread in 2 tbsp vinegar. 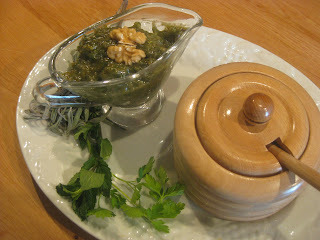 Using a food processor, blend herbs, bread, garlic and nuts into a smooth paste, gradually add olive oil. Add the honey. If the sauce is too thick add a little more vinegar and salt to taste. Serve at room temperature or heat in the microwave for 30 seconds. If alexander is not available, use parsley. If using a thermomix stems may be included. If honey is too thick to handle easily, microwave for 30 seconds.